Engine Timing Belt Kit with Water Pump-Water Pump Kit w/Seals DAYCO WP337K1AS. Country of Origin (Primary) : IT. Harmonized Tariff Code (Schedule B) : 8413309000. Life Cycle Status Code : 2. Also review the notes section in the compatibility chart for additional specifications about this part. This part generally fits Hyundai, Kia vehicles and includes models such as Magentis, Optima, Rondo, Santa Fe with the trims of EX Luxury Wagon 4-Door, EX Sedan 4-Door, EX Wagon 4-Door, GL Sport Utility 4-Door, GLS Sport Utility 4-Door, LX Sedan 4-Door, LX Wagon 4-Door, SX Sedan 4-Door. The engine types may include 2.7L 2656CC V6 GAS DOHC Naturally Aspirated. This part fits vehicles made in the following years 2007, 2008, 2009, 2010. We at PartsMonkey are proud Canadians and are proud to serve our fellow Canadians. We offer a full range of automotive products from chassis components to auto body parts and everything in between. 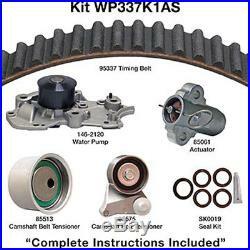 The item "Engine Timing Belt Kit with Water Pump-Water Pump Kit withSeals DAYCO WP337K1AS" is in sale since Friday, April 14, 2017. This item is in the category "Automotive\Parts & Accessories\Car & Truck Parts\Engines & Components\Timing Components". The seller is "partsmonkeyca" and is located in London, Ontario.